This is the second part of my post on bullet journaling. To get a background on what I'll be covering in this post, head on over to the first part! You can watch this nifty video on Bullet Journaling to get an idea on what it's all about. But the TL;DR is—"[it] is a customizable and forgiving organization system. It can be your to-do list, sketchbook, notebook, and diary, but most likely, it will be all of the above...". And it's true. My bujo has become all these things. It might seem confusing at first, but once you sit down and do it, it really does become second nature. And keeping it up to date is simple. It takes me five minutes at night to update tasks, notes, write my gratitudes, track my habits, and set myself up for the following day. Maybe it takes me ten or fifteen minutes if I decide I need to journal on top of it. I'm not going to be showing pictures of my bujo, as some of it is kind of personal, but I use it as a replacement for most of the items I covered in my first post, and I'll talk about it. Getting the supplies was the easy part. I just purchased the cheapest dot grid notebook I could find on Amazon that had a decent rating. You don't need anything fancy. In fact, when I was waiting on this to come in, I just used one of my lined journals (which, admittedly, I didn't enjoy as much, but it was something). I also have a set of erasable pens that I absolutely adore made by Pilot. I like being able to erase (I hate scribbling thing out—it drives me crazy), but I also like the flow and feel of writing with a pen. These pens have been a godsend for me in that regard. Especially since they come in different colors. Unfortunately, I've only been able to find refills in Black, but that's okay, because they're the pens I use the most often out of the pack. I decorated my journal a bit with some scrapbooking supplies, and I used sharpies (lesson learned for next time: Don't. Use colored pencils instead.) to color code the edges of my pages as a secondary index (for instance, January is red and in a specific spot every time it's a page relating to January). But all this isn't necessary to bujo. There are plenty of people who use a minimalist approach, and honestly on a day-to-day basis, I use a minimalist approach. There's barely anything decorated, and I only use cursive because I write faster in cursive than I do in print. Trello - I used this to track my media. Now, I have pages in my bujo dedicated to each type of media: games to play (listed), books to read (listed), comics to read (listed), comics to buy to try (listed), movies to watch (listed), and television shows to watch (using a grid-like system). Just to name a few. Google Calendar - I still use this as a backup for when I don't have my bujo, or when I need to pull up an address to GPS, or when I need an alarm reminder for a specific event. 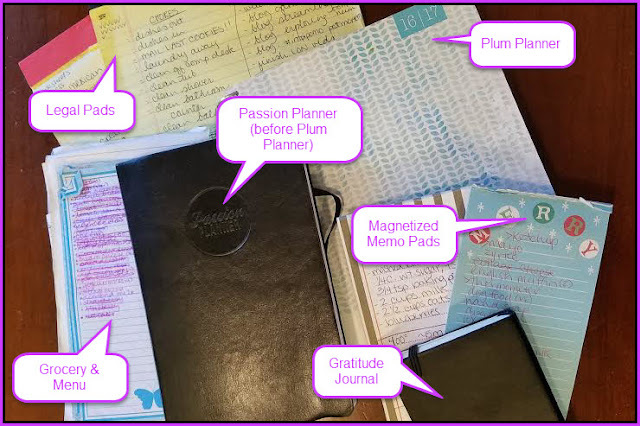 Plum Planner - The bullet journal itself has taken on the job of my old plum planner. Sticky Notes - I still have some laying around, but they're more for when I'm tanking in raids. For instance, when I have to drag Cenarius around in Emerald Nightmare, I'll write what marker order to drag him to (shorthand) and put it on my second monitor. They are no longer a to-do list or random thought dump area. Tumblr - This used to be my journal. My journal has since completely moved to my bujo, and I'll probably save my important posts and delete it. Gratitude Journal - This has completely moved over to my bujo as two pages in the front of the month. I have space to write two shorter items, or one long one every day. 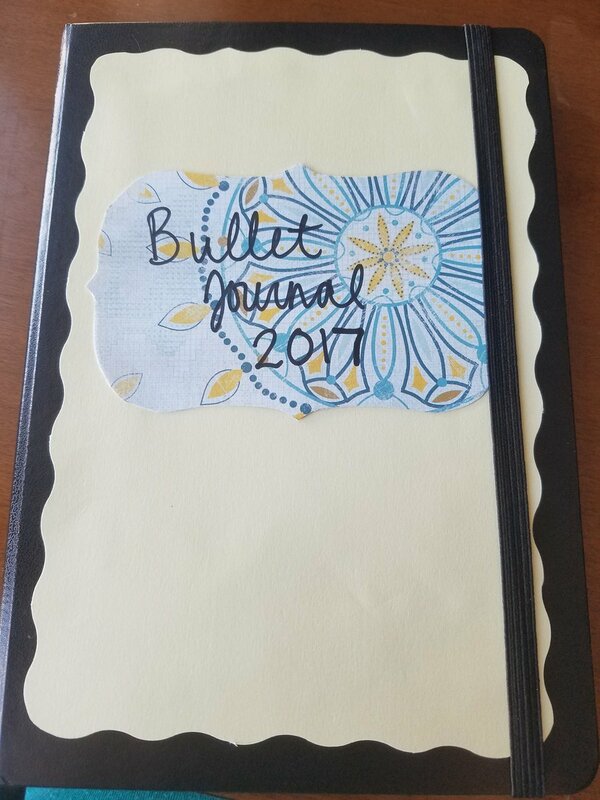 Legal pads - Everything I did on these (to-do lists, menu and grocery planning, thought dumps, etc.) have since moved over to my bujo. They're kind of just sitting and collecting dust, now. Magnetized Memo Pads - I still keep these on the fridge to write down what I'm out of when I notice I'm out of it, but other than that, they don't get used for anything. Stuff I need to buy gets copied into my menu/grocery page for the week and off I go to the grocery with my bujo. Overall I've seen a vast improvement on my stress/anxiety levels, and my pocketbook is glad to have much less in it on a daily basis.